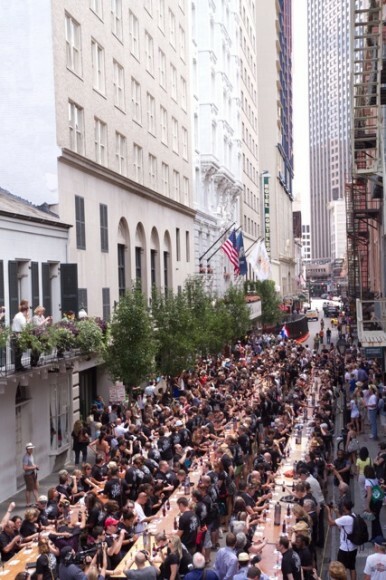 Three years after setting a world record for the largest Kopstootje, those striving Bols folks are ready to set a new world’s record at Tales of the Cocktail – watch out for the world’s largest Pousse Café. On July 19th in New Orleans, three years after their first world record was set Lucas Bols will attempt to set another record during Tales of the Cocktail by creating the world’s largest Pousse Café. By doing so, Lucas Bols is reintroducing a forgotten art of cocktail making called layering. To showcase the complexity as well as at the excitement of layering a cocktail, the team of the Bols Bartending Academy will use a 670 oz glass and will layer over 10 different Bols Liqueurs and many other spirits on to set the record for the world’s largest Pousse Cafe cocktail ever made. Historically served as a “coffee push” to add a little sweetness to an afternoon coffee, today the Pousse Cafe has become an independent style of cocktail making. A layered (or “stacked”) drink, sometimes called a pousse-café, is a kind of cocktail in which the slightly different densities of various liqueurs are used to create an array of colored layers, typically three to seven. The specific gravity of the liquid ingredients increases from top to bottom. Liqueurs with the most dissolved sugar and the least alcohol are densest and are put at the bottom. These include fruit juices and cream liqueurs. Those with the least water and the most alcohol, such as rum with 75% alcohol by volume, are floated on top. 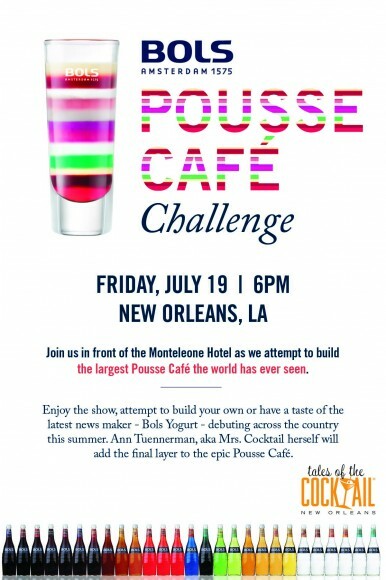 It is said that the Pousse Cafe made its US debut in New Orleans in the mid-19th century. What we know for a fact is that the famous local New Orleans bartender Nick Castrogiovanni at Nick’s Big Train Bar was known for his Pousse Cafes and therefore it is even more perfect that the attempt will take place in New Orleans. Ann Tuennerman, another famous local as the founder of Tales of the Cocktail (www.talesofthecocktcail.com), who visited Nick’s when she was still a college student, will add the last layer to the Pousse Café created by the Lucas Bols team. 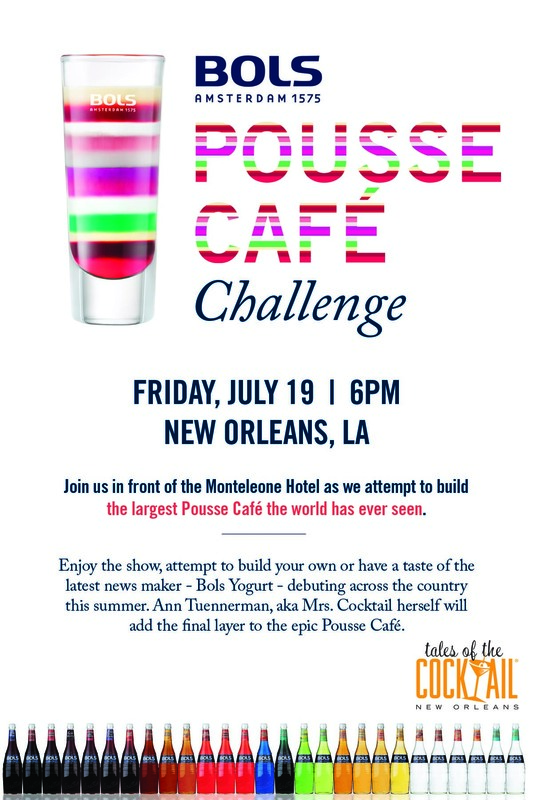 In addition to attempting to set the world record, Do it Yourself bars will be set up around the stage in front of the Monteleone Hotel where onlookers will get the chance to win prizes by creating their own Pousse Cafés. The record attempt will take place on Friday the 19th of July from 6pm until 7.30pm C.S.T. in front of the Monteleone Hotel (www.hotelmonteleone.com).